Professor Avolio holds a Doctor of Business Administration (DBA) degree from Maastricht School of Management, The Netherlands, a Doctorate in Business Administration from Pontificia Universidad Catolica del Peru, a Master’s degree in Business Administration from ESAN, Peru, and two undergraduate degrees from Universidad del Pacífico, Peru: one in Business Administration and another in Accounting. Professor Avolio is a specialist in financial and administrative management, financial planning, project development and execution, risk analysis, and educational management. She has worked in the accounting and administrative division at several internationally renowned companies, such as Price Waterhouse, Southern Peru Ltd., and Procter & Gamble (Deter Perú S.A.). She has had several senior administrative and academic job positions at CENTRUM Católica Graduate Business School, such as: Director of Executive Education, Director of Academic Affairs, and Administrative Director. 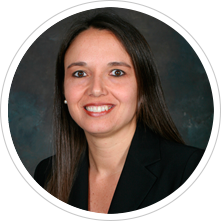 She has more than 20 years of teaching experience in specialized courses related to finance and accounting. She is also a Visiting Professor at EADA Business School, Spain, and an Honorary Professor at Maastricht School of Management. She is the founder of the Center for Women at CENTRUM Católica, a division oriented to promote the capabilities of women in several fields, through the generation of knowledge related to womens economic and professional activities. D’Alessio, F., Avolio, B. E., & Vincent, C. (2019). Studying the impact of critical thinking on the academic performance of executive MBA students. Thinking Skills and Creativity, 31, 275-283. Avolio, B. E., Benzaquen, J., & Pretell, C. (in press). Global challenges for business education and the new educational agenda: Graduate attributes and teaching methods. To appear in e-Journal of Business Education & Scholarship of Teaching. Avolio, B. E., Accoustupa, R., Bermúdez, R., Chávez, R., & Montes, R. (2018). Good and bad payers: An exploratory study of women microentrepreneurs’ payment compliance in Latin America. Revista Espacios, 39(39), 1-18. Avolio, B. E. (in press). Towards realizing the real potential of Latin America’s women entrepreneurs: An analysis of barriers and challenges. To appear in Latin American Research Review. Almenara, R., & Avolio, B. E. (2017). A descriptive study of organizational citizenship behavior in Peruvian companies. International Review(3-4), 9-23. Avolio, B. E., & Di Laura, G. (2017). Progreso y evolución de la inserción de la mujer en actividades productivas y empresariales en América del Sur. CEPAL Review, 122, 35-62. Avolio, B. E., Alcalá, P., Rurush, M., Vilca, P., & Zelaya, D. (2016). Strategies for the professional development of executive women: Empirical evidence in Latin America. Journal of Women’s Entrepreneurship and Education, 3-4, 45-65. Avolio, B. (2016). Rethinking teaching methodologies in business education. International Journal of Case Method Research & Application, 28(2), 81-96. Avolio, B., Calderón, F., Rojas, N., & Tokashiki, M. (2015). Methodological proposal to measure social performance in microfinance institutions. Journal of Economic Analysis, 48(3-4), 81-100. Avolio, B. (2015). Pedagogy innovation in business education. IPSI Transactions on Advanced Research, 11(2), 12-17. Avolio, B., García, S., Knutson, R., Maldonado, L., Peñaloza, J., & Van Dyck, R. (2013). The role of the partner of an entrepreneur. Journal of Women’s Entrepreneurship and Education, 3(4), 51-73. Avolio, B. (2012). Why women enter into entrepreneurship? An emerging conceptual framework based on the peruvian case. Journal of Women’s Entrepreneurship and Education, 3(4), 43-63. Avolio, B. (2011). A methodological problem associated with researching women entrepreneurs. Journal of Women’s Entrepreneurship and Education (1-2), 9-25. Vincent, C., Kumar, M., Zegarra, L. F., & Avolio, B. (2011). Benchmarking Peruvian banks using data envelopment analysis. Journal of CENTRUM Cathedra, 4(2), 147-164. D’Alessio, F., & Avolio, B. (2011). Business schools and resources constraints: A task for deans or magicians? Research in Higher Education Journal, 13, 1-37. Avolio, B. (2010). Métodos de valorización de empresas. Técnica Administrativa, 9(3). Avolio, B. E., Hansen, D., & Mowen, M. (2017). Administración de costos. Contabilidad y control(1st ed., pp. 627). Lima: CENGAGE Learning. Radović-Marković, & Avolio, B. (2016). Qualitative methods in economics(pp. 208). New York, NY: Routledge. Marquina, P., Velásquez, I., Garriga, E., Cabrera, G., Fuertes, A. R., Avolio, B., Di Laura, G., Cornejo, A., Sánchez, S., Guevara, R., Scott, G., Rizo-Patrón, C., & Del Águila, L. (2016). In Marquina, P. (Ed. ), Empresas responsables y competitivas. El desafío de hoy(pp. 520). Lima: Pearson. D’Alessio, F., Avolio, B., Graham, A., Guevara, R., & Marquina, P. (2015). Planeamiento estratégico del sistema educativo del Perú: 2015-2024(pp. 515). Lima: CENTRUM Publishing. Avolio, B. (2015). Métodos cualitativos de investigación: Una aplicación al estudio de caso(pp. 232). F.: CENGAGE Learning. Avolio, B., Granda, L., Guerrero, B., Infantas, P., Gutiérrez, A., López, J. C., Morales, S., & Salcedo, M. (2013). Mujeres ejecutivas en grandes empresas(pp. 289). Lima: Aguilar-Grupo Norma. Avolio, B., & Radović-Marković (2013). Women and entrepreneurship: Female durability, persistence and intuition at work(pp. 182). Farnham: Gower Publishing. D’Alessio, F., Avolio, B., Aguilar, J. M., Benzaquen, J., Graham, A., O’Brien, J., et. al. (2012). Planeamiento estratégico del sistema educativo del Perú. Lima: CENTRUM Publishing. Marquina, P., Avolio, B., Rosselló, C., Ballón, M., Becerra, M., Chávez, C., et al. (2012). Casos de marketing. McGraw Hill & CENTRUM Publishing. Stickney, C. P., Weil, R. L., Schipper, K., Francis, J., & Avolio, B. (2012). Contabilidad financiera: Una introducción a conceptos, métodos y usos(pp. 824). Buenos Aires: CENGAGE Learning. Avolio, B., Marquina, P., Guevara, D., Aguilar, D., Aldana, G., Angulo, M., et. al. (2012). La mujer peruana: Evolución y perspectivas para su desarrollo futuro(pp. 490). Lima: Planeta. D’Alessio, F., Avolio, B., Canales, S., Esteban, R., Martínez, J., Polo, M., Reynoso, J., & Ruiz, J. (2012). Plan estratégico de la región Piura. Lima: CENTRUM Publishing. Alarco, G., Avolio, B., C., B., Cárdenas, J., Chang, L., D’Alessio, F., Duarte, O., et al. (2010). In G. Alarco (Ed. ), Rutas hacia un Perú mejor. Qué hacer y cómo lograrlo. Lima: Aguilar/Grupo Santillana. Avolio, B., Martínez, F., Valdivia, C., & Kitsutani, L. A. (2008). Plan estratégico para el transporte ferroviario en el Perú. Pearson Educación Prentice Hall. Avolio, B., Camacho, I., López, L., & Pérez, F. (2008). Propuesta para el desarrollo de la gastronomía peruana. Mexico: Pearson Educación Prentice Hall. Indacochea, A., Avolio, B., Bedoya, L., Carrillo, J., Negrón, G., Sánchez, L., & Santillán, M. (2001). Cajamarca competitiva(3rd ed.). Saywa Ediciones. D’Alessio, F., & Avolio, B. (2016). Financing business schools. In Terri Friel (Ed. ), Advanced management for deans. North Carolina: Information Age publishing. Avolio, B., & Di Laura, G. (2016). Igualdad de género en el ámbito laboral: Análisis y perspectivas. In Marquina, P. (Ed. ), Empresas responsables y competitivas. El desafío de hoy(pp. 197-239). Lima: Pearson. Avolio, B. (2010). Hacia una sociedad de mujeres empresarias. In G. Alarco (Ed. ), Rutas hacia un Perú mejor. Qué hacer y cómo lograrlo(pp. 459-481). Lima: Aguilar/Grupo Santillana. Award for full time faculty academic excellence CENTRUM PUCP, 2011, 2012, 2013, 2014, 2015, 2017, and 2018. Award for intellectual production CENTRUM PUCP, 2012, 2013, 2014, 2015, and 2016. Professor distinguished for academic excellence and distinguished researcher. Professor Avolio currently is the Head of the Graduate Business Department at Pontificia Universidad Católica del Perú, Director of Faculty, Director of the Women’s Center, and Professor and Researcher at the Finance, Business Economics, and Accounting Department at CENTRUM Católica Graduate Business School. She is member of the founding team of CENTRUM Católica Graduate Business School and member of the Pro-women Committee at the National Science and Technology Council (CONCYTEC).